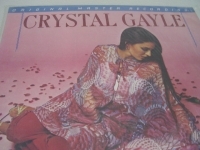 "Crystal Gayle, One Must Believe In Magic - Factory Sealed MFSL - JVC Half-speed Japanese Pressing"
MFSL ORIGINAL SEALED LP - CRYSTAL GAYLE - WE MUST BELEIVE IN MAGIC - This is a MFSL Super Virgin Vinyl (so pure that you can see through it if held up to the light) JVC Half-Speed Japanese Pressing. Recording is from the Victor Company of Japan for state of the art audiophile pressings. THIS PRESSING HAS THE ORIGINAL LIMITED EDITION MARKETING STICKER ON THE FRONT THIS IS OUR LAST COPY FOREVER. Must Believe In Magic" was originally released in mid 1977, & commercially, it was a breakthrough album for Crystal--it peaked at #12 on the Billboard charts & was certified platinum within a year of its original release, largely thanks to the huge, million-selling hit "Don't It Make My Brown Eyes Blue". The album really did deserve the success, because most of the album is great, displaying Crystal at her best--as ever, her vocals are consistently sumptuous, & although she didn't write anything here, her expressiveness is one-of-a-kind & she consistently comes up with just the right treatment to get maximum impact from each track--in other words, she very much makes the songs her own. The aforementioned "Don't It Make My Brown Eyes Blue" opens the album--it's somewhat jazz-flavored and it's wonderfully breezy with an irresistible rolling piano part, and it's melancholy, yet not depressing--as good as it is, don't let its commercial success fool you... Not only are there a bunch of other great songs here, but the album is also impressively varied--there's the amusingly dramatic "River Road", the stomping bluesy rocker "Green Door", the wistful ballad "Make A Dream Come True", the somewhat frantic Cole Porter cover "It's All Right With Me", the stately, otherworld-ish title track with hypnotic wordless vocals from Crystal, & the punchy, somewhat sneering "All I Wanna Do In Life", all of which are gems. As much credit as Crystal herself deserves, you also can't deny the excellent job by producer Allen Reynolds--there's lots of neat stuff going on like the clanking percussion, flutes, & phasing on "All I Wanna Do In Life", the cool orchestration on "Make A Dream Come True", a combination of fiddle and biting guitar on "It's All Right With Me", & Moog synthesizer (and god knows what else) on the title track. The weakest track is the somewhat ho-hum ballad "Going Down Slow", but it's still got the cool interplay of the phased guitar line & the orchestration. I have a complaint with this album, & it's the same complaint I have with so many of Crystal's albums--it's too darn short!! Clocking in right around half an hour, it really cries out for a couple more songs. Yes, I'd rather have half an hour of great material than 15 minutes of great material & 25 minutes of dreck--I'm not denying the consistent high quality of this album, but it is on the short side. Still though, this is a highly recommended album. Plus, the album sleeve with the checker-board style of the photograph of Crystal with her increasingly ultra-long hair is smile-inducing. Don't expect to find the Razor & Tie label's CD release of this album at a low price. Tracks from this album regularly crop up on Crystal compilation CDs of which there are a LOT. There are also a lot of vinyl copies around that you can probably get at a very reasonable price so you can hear ALL of the tracks from the album in their original running order. "We Must Believe In Magic" is a great showcase for one of the most sublime vocalists of all time, Crystal Gayle. Product Description 1. "Don't It Make My Brown Eyes Blue" (Richard Leigh) - 2:37 2. "I Wanna Come Back to You" (Johnny Christopher/Samuel Hogin) - 2:54 3. "River Road" (Sylvia Fricker Tyson) - 3:08 4. "It's All Right with Me" (Cole Porter) - 2:32 5. "Going Down Slow" (B. Bond) - 3:41 6. "All I Wanna Do in Life" (Allen Reynolds/Sandy Mason Theoret) - 2:26 7. "Make a Dream Come True" (Larry Kingston) - 3:06 8. "Green Door" (Bobby David/Marvin Moore) - 3:11 9. "Funny" (L. Anderson) - 2:05 10. "We Must Believe in Magic" (Bob McDill/Allen Reynolds) - 4:09 This MFSL LP was pressed in Japan before Mobile Fidelity Sound Labs eventually pressed their Lps in the United States. The LP was Half-Speed Mastered with the Ortofon Cutting System from the Original Stereo Master Tapes. This MFSL LP has a special static free, dust free inner sleeve and heavy-duty protective packaging. This LP has been Out of Print for 25 years and a bonafide audiophiles collectible. MFSL LIMITED EDITION. This Limited Edition FACTORY SEALED LP is an audiophile collector?s item that simply gives the feeling of being directly in the studio with the artist. Used nothing but the finest lacquers. The more you play the LP, your stylus will polish the grooves and actually improve the sonics of your MFSL LP. This recording is mastered from the Original Session Tapes. This Out of Print LP has all Liner Notes, Photos, and Artwork from the Original LP faithfully recreated. A SONIC WORK OF ART. These Out of Print gems are the FINEST/RAREST of the audiophile LP market. The future of these collectibles is so exciting because each piece is a sonic work of art that will never be reproduced using this state of the art proprietary technology, high quality ingredients and attention to detail from beginning to end. The depth and dimension of the music is delivered back to you with all the dynamics and richness of the live recording session. With Mobile Fidelity, you will come as close as possible to hearing the three-dimension quality of the music just as the artist intended it to be.